It all started simply enough. 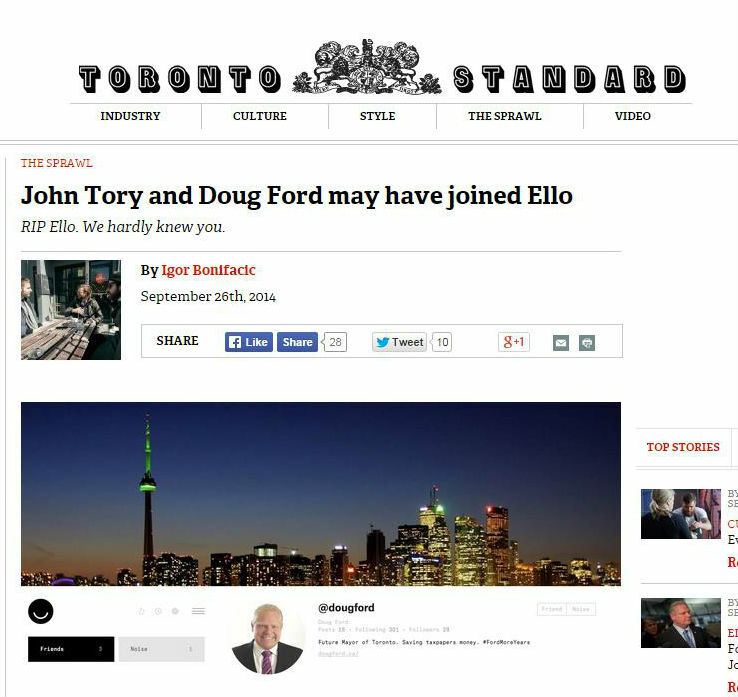 I registered "Doug Ford" on Ello in jest. And then decided to start adding some friends. At which point, the fun began. 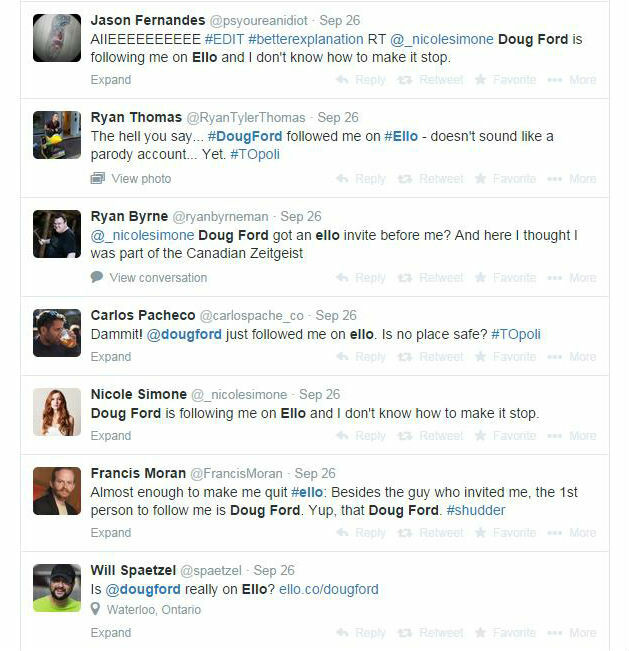 I left the office with hundreds of email notifications from Ello, dozens of tweets and even an article in the Toronto Standard! Which is when things turned dark. Very dark. My 24 hours of being Doug Ford taught me 7 key things. Ello, is it me you're looking Ford? It all started simply enough. I had an Ello account, and a friend was offering second invites. So I joked about registering Rob Ford's (y'know, "The Crack Smoking Mayor of Toronto", a.k.a. "oh gawd please go away" to us downtown elitists). And then decided to start adding some friends. Except, apparently, my profile was real enough that people thought it actually WAS Doug Ford, and both Facebook and Twitter (#TOPoli is our local political hashtag) started blowing up with people upset at and demanding to know who the hell let Doug Ford into their exclusive little club! At which point, the fun began. I even did everything I could to add as many people who did NOT like Rob Ford as possible. Including, but not limited to, whenever someone demanded Rob Ford unfollow them (an hourly occurrence), I would Friend all their Friends. My favourite hashtag was, by far, #FutureFordward. Come on, hire me as your campaign manager, Doug! Yes. A free blanket if you're homeless and donate to "my" campaign. How caring! I left the office with hundreds of email notifications from Ello, dozens of tweets and even an article in the Toronto Standard! Which is when things turned dark. Very dark. I went out for drinks with friends, and throughout the evening, watched Doug receive nearly half a dozen death threats (all of which have since been removed... darn me and not taking screenshots), dozens upon dozens of insults (most of them beyond the pall of civility) and hundreds of tweets and Facebook updates talking about feeling "dirty" for even having Ford follow them. Now, of course, Ford has his issues. He is often a bully, has spread homophobic comments, insulted the police, firemen, autistic children, Toronto City Hall & Council, the media, "downtown elite", etc. People from both sides of the spectrum can be borderline evil. One death threat was for me to burn in my own feces for all eternity. Several wished death on my entire family. If I go through this many in just a day, imagine how many Doug and the Fords go through on a regular basis. When you get that much hate that people constantly want you dead, is it any wonder they are disconnected from reality? The people who support the Fords truly do support them unconditionally. Many of these people have huge hearts and see this vitriol daily and want to protect them from people who are, truly, heinous. They aren't stupid. They aren't misguided. They've just chosen to care for their own to such an extent that they're truly okay with a few "minor flaws." The vehicle tax is still seen as saving grace. Even though the Fords increased property taxes by thousands of dollars. The vehicle tax is something supporters feel like was money put back in their pockets and they truly are forever grateful. If you dislike the Fords and think you're either an intellectual or better than them in some way. It is time for you to step up and slam down on people who are vitriolic and hateful, and to do it hard. Because one of the reasons you likely claim to dislike them is their hate, and tolerating hate against them while deriding their hate speech is undoubtedly one of the things that perpetuates Ford Nation. Even being Fake Doug Ford, it's amazing how much of the hate that was directed at Doug seeped into me. By the end of the night I was in an incredibly dark place. It took some amazing friends to convince me to put the phone down, stop the joke, step away and have some fun. 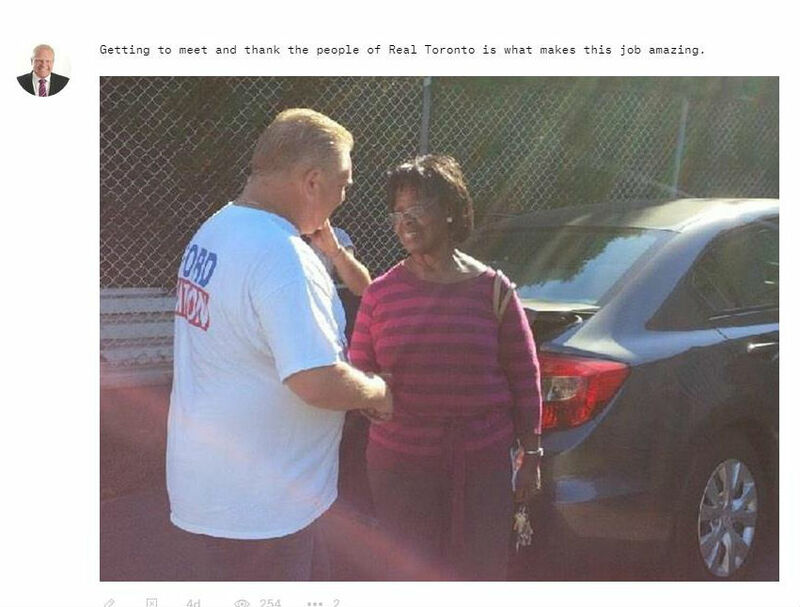 Everyone is human, even Doug Ford. So, yes, it was fun for a while. I enjoyed the level of anger from the "elitists" when I purposefully misspelled it as "elitetists." I took a perverse joy in the tweets that I had "ruined" Ello before it even took off. But, people, let's not lose our humanity in the pursuit of a better Toronto. Yes, Toronto deserves better than the last four years. But we also deserved better than Miller and Lastman as well. My hope is that we will soon have a true leader who is worthy of the title of Mayor of the greatest city I've ever lived in, and the one I plan to call home for my entire life. But if we get there through hate, vitriol, death threats and alienating an entire part of our city? We won't receive the leader we need, we will receive the leader we deserve.